Juniper Springs Ranch’s sweeping vistas, pristine acreage, and private recreation make it a world apart—but it isn’t. This remarkable tract of land and luxurious home are so far yet so near. The log gates to the Juniper Springs Ranch open to Hemingway’s kind of country: 1,100 acres of pristine land where the early native peoples and the sheepherders may have paused in awe of the silhouetted Pioneer Mountains but have left no trace. Companions on the property are proud elk, trotting fox, soft-eyed deer, and stillness. It is a place to connect with the land and sky and to feel a powerful wholeness that only nature can impart. It is at the end of the road where privacy begins and compromise ends. The ranch land starts at the gate and extends to a canyon, mountainside, and as far as the eye can see. Beyond the boundaries are the open vistas of undeveloped public lands. Remarkably, all of this is possible while still living within the city boundaries of Sun Valley. 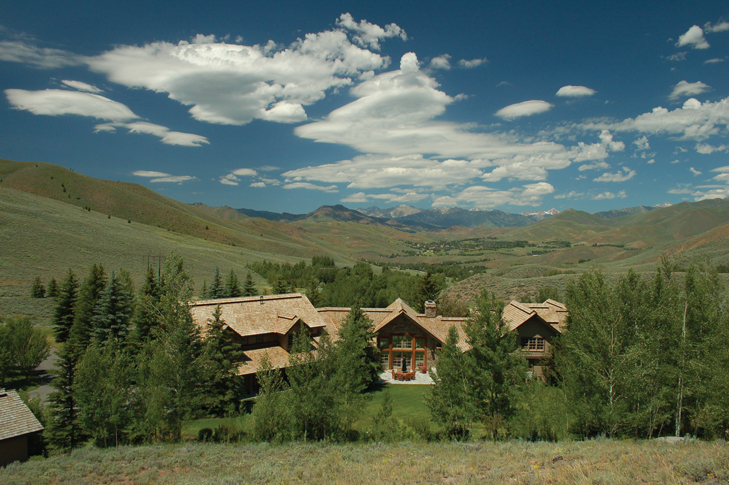 It seems incongruous that one could have the solitude afforded by 1,100 acres, yet be only eight minutes from downtown Ketchum and its fine dining, community events, and rich cultural offerings. It is indeed the best of both worlds, especially when entirely connected by paved and serviced roads. And just beyond the gate is Sun Valley Resort’s 18-hole Elkhorn Golf Club. The oldest tradition of mountain cabins and homes is to be able to just step outside to enjoy outdoor recreation, and here Juniper Springs Ranch doesn’t disappoint. Just saddle up to ride the property’s trails and catch the sunrise, or snap on cross-country skis for fast aerobic exercise in the crisp winter air. For ATV and snowmobile enthusiasts, there is no need for permits or trailers: simply start up and go. Exploring by ATVs, bikes, skis, snowmobiles, horse, and foot acquaints oneself with this unique and exquisite 1,100-acres. It’s the Old West and unspoiled Idaho, just as nature created it, and a vanishing opportunity that few may ever enjoy. 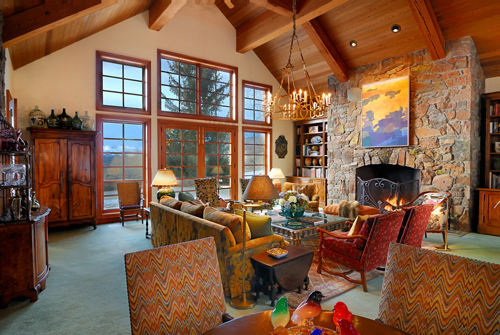 The sumptuous European-lodge-styled home is worthy of its setting. Resting in a saddle, it is sited so the commanding views saturate the generous windows and the outdoor living spaces. At the same time, the home graces the land from an ideal location that adds to the beauty of the topography. Just under 10,000 square feet, the home works for a couple, a family, and a houseful of guests ready to have fun. The formal living room is poised to entertain. On both the east and west sides, guests can spill out the lofty French doors to Oakley stone patios to celebrate the evening; as temperatures cool, they can gather around the massive stone fireplace. 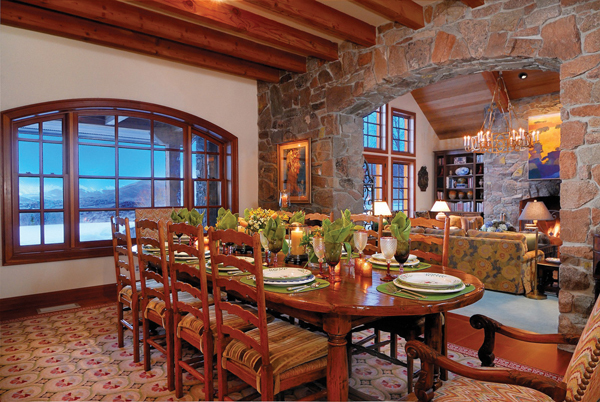 For formal entertaining, there is a dedicated dining room with a stone archway, timbered ceiling and dazzling views, and for more casual meals, a cozy breakfast table sits in a corner surrounded by windows just off the kitchen and the relaxing family room. 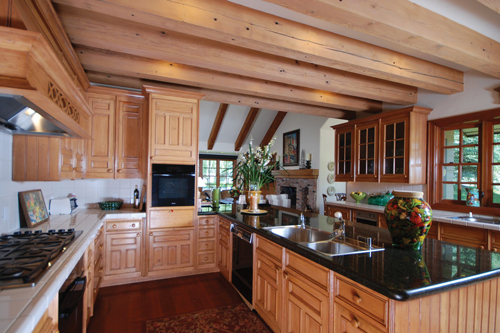 The spacious kitchen island has bar seating, and the kitchen workspaces have plenty of room for several cooks to concurrently tackle challenging recipes with space to circulate. There are six bedrooms, including the lavish master suite and private caretaker’s quarters. It is a home designed for enjoying life. Swimming is possible year-round with an indoor pool enclosed by French doors that open for summer weather. Complementing the pool are a wet bar and a full bath for changing. Full enjoyment of mountain life throughout the four seasons calls for toys and vehicles, and the garages are ready. Attached is a two-car garage, and an additional separate three-car garage has an RV bay and additional covered parking and storage. The exquisite home’s design and function revere the connections to the land and its postcard views. Larger terraces provide for covered outdoor dining and gathering socially, while there are smaller patios and terraces for quiet moments along with an outdoor spa. For strolling, there are manicured lawns and two ponds for interest, and always there is the open space and the views. It is still possible to own a piece of paradise.